Materials at WSA cemented its role at the heart of the footwear and accessories industry last month, when over 1,200 product developers, designers, technologists and retailers participated in the 'show within a show. These buyers, representing nearly all the major US brands, were looking for materials innovations and inspiration, and found them in abundance. Commenting on his visit to the show, Ron Hillas, materials sourcing manager for Deckers Outdoor Corporation, says As a sourcing manager it is important to seek out new sourcing options, and while I was at show I did some real digging. I came up with some great technological opportunities for our brands and was able to cross several items off my 'wanted' list, one being a long-term goal. Great stuff! Offering an array of exhibitors from around the world, an Innovation Station plus a raft of special seminars and workshops, there was plenty for the industry to see. Furthermore, unlike the inaugural event in February, Materials at WSA was timed to completely coincide with The WSA Show. This decision was a major success according to exhibitor, Victoria Liu, VP marketing and sales at US-based tanner, Henan Prosper, Being integrated into one show where the entire footwear industry meets made it a perfect way to meet existing customers and those all important new contacts. Marshall Cohen, chief retail industry analyst for The NPD Group, in his seminar at The WSA Show argued that consumers are looking for product that offers them value today that means product that is worth the money, exceptional and lasting. Materials at WSA gave designers and developers plenty of ideas on how to build these qualities into their products. For instance, Millliken Chemical used the show to launch ViviTint colorants, a new class of colorants that give the kind of vibrancy-of -color, glass-like transparency and special effects that have never been seen before on synthetic leather. 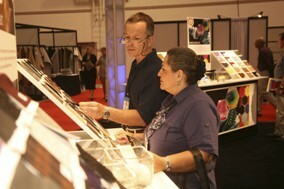 Lisa Clark, the company's business development manager says, The show was the perfect way for us to reach the massive footwear design community which operates out of the U.S. to inspire them and show them what new color effects are possible. Stan Karro, application development manager at Rogers Corporation, says, We have had a fantastic three days. We met many new prospects that we really wanted to reach and also spent constructive time meeting with current customers reviewing our new product. It has been a really productive show. BettyJou Industrial found there was huge interest in its shoe d cor products. These range from flowers, bow ties and lace through to acrylic stones. Visitors were equally drawn to Wonjin International's Puff Screen technology, which through special heat responsive inks can create an embossed look on leather at a very low cost. Courtney Harold, show director, is thrilled with the feedback and comments. The industry expressed the fact that the show really was a hot-bed of new ideas. It proved itself as a place to network, learn and be inspired. We brought innovation straight to the door of designers and brand owners at the very time when they need it most. To find out more about the Materials at WSA Expo and Conference, in February 2009 visit www.materialsatwsa.com. Learn more about Materials at WSA.